My husband doesn’t understand it. My children just roll their eyes. Sorry people, but I have to gush…just a bit. Just have to swell with just a little bit of excitement. My favorite actress is back! Not that she was really gone. Her character left ER in the episode written just for her – ‘The Book of Abby’ – in October of 2008. Abby and Luka moved to Boston. She returned for a small cameo seventeen episodes later giving Paraminder Nagra’s ‘Neela’ a reassuring nudge to leave Chicago. Then she was gone….from television. Talk about quitting cold turkey. Not her. Me. I was used to getting spoiler alerts, google alerts, tweets and bits and pieces about ‘ER’ in general…..but Maura Tierney specifically. I had been a fan of hers since….well….forever. I even tripped totally out of my comfort zone and took my two personal business days in SEPTEMBER (I am a Teacher, remember?) to fly to New York to see her perform in an off Broadway play. Even got to meet her while I was there….twice! And now, there was nothing. While she was off relaxing, recouping and living her ‘regular’ life, there were a legion of fans (and I know this is true as I am privy to several web groups of fans) watching….and waiting …..for her next project. There was a flurry of excitement with the news that she would be part of the cast of ‘Parenthood’ – NBC’s newest series in development. The cast was phenominal with Maura at it’s center playing ‘Sarah Braverman’, single mom of 2 teens who moves back into the family fold. A dysfunctional family fold. I was so excited at the prospect of a regular dose of her talent again….and even more intrigued at the thought of seeing her ply acting chops with Mae Whitman – another favorite – who was cast as her daughter. A pilot was shot, publicity rounds started and things began to leak out about the show. Most of the critics gave the pilot a so-so rating but all of them said that Maura’s performance was a highlight….giving the show promise. All was well in my little world and I was looking forward to the all season. Then devastating news that Maura would be leaving the show because of a health issue. A health issue that required surgery and subsequent treatment. Maura Tierney had breast cancer. You can imagine the frustration of the production team. What to do now? Their show was set. Scripts written. And one of their stars was going AWOL. Unofficial word from someone who worked on the set via someone on one of the web boards was that the production team was willing to wait out the surgery and support the treatment plan. Word was they were attempting to force her to honor her contract. But she held her ground (not wanting that particular period in her life to be filmed in HD…who can blame her?) and in the end, they let her go. They recast the part and the show continued. It was one of the hits of midseason….and definitely a ‘different’ kind of show than it would have been had she stayed. My sister loves it. And once again I – we – were reduced to waiting for bits and pieces of news. And there was nothing. Absolutely nothing. Until December. That is when Joe Tierney, former Boston Councilman and Maura Tierney’s father, died of cancer. A surprise to the general public, I think. Followed shortly by the news that Maura Tierney would be joining the cast of ‘North Atlantic’ by theater’s eccentric Wooster Group. Even before the production went into rehearsal there were bits and pieces…and once rehearsals started – pictures! Grainy, clandestine pictures. When the show started there were ‘reviews’ and updates and pictures from web friends. One particularly special internet buddy was able to see the show in Los Angeles (where she goes to school) AND New York (where she was participating in a school sponsored program)….twice! The gods were with her and the timing worked out. Lucky. But now, Lady Luck has struck again – for all of us. 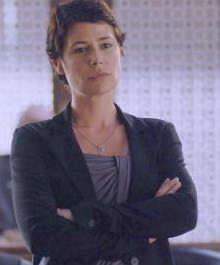 Maura Tierney will be returning to weekly television in September…this time with ABC’s ‘The Whole Truth.’ She will be trading her emergency room scrubs for stylish suits as an officer of the court. Somehow, I think her dad would approve. And being the lover of legal eagle television that I am, I will be watching. Welcome back, Maura. You have been missed. Christmas 2009…Part 5….Better and better….. It wasn’t until the Sunday AFTER Christmas that all of her doctors and nurses consulted and were finally able to get my mother off her ventilator. 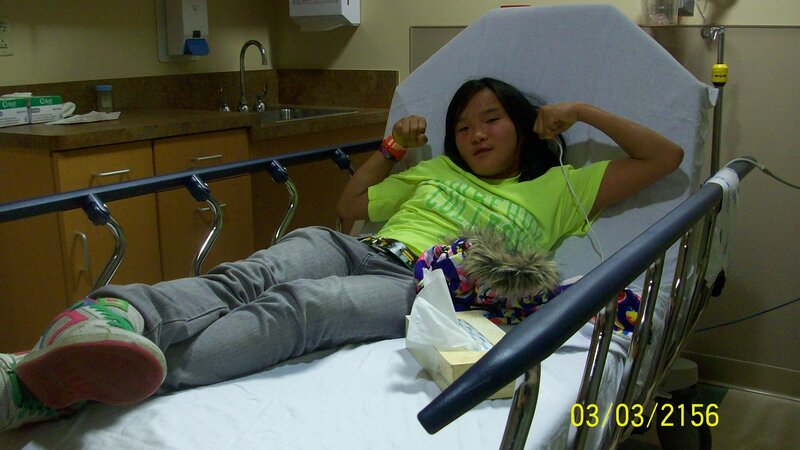 By that time the sedation had worn of…sort of. She managed to maintain a steady oxygen level on her own. She was fighting the vent. So they did it. And dang, if this tough old bird hadn’t used up ANOTHER of her nine lives. She was hungry. And she let everyone know it. She wanted her Christmas presents. And she let everyone know it. And she wanted to see pictures……of what she had missed. Her color was so much better. Her demeanor, even more so. She kidded with her doctors, teased her nurses and verbally sparred with all of her visitors. THIS was the mother I knew best. 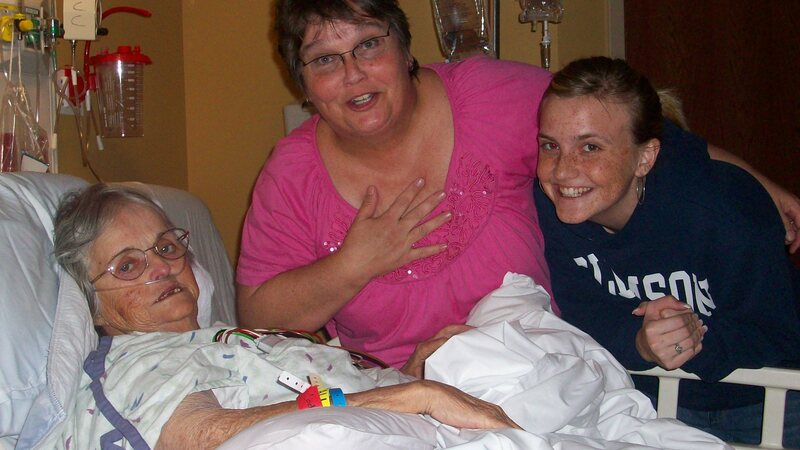 She was moved from the ICU to a step down room so it was easier for people to come and see her. And remember that stint in the sleet while I was boldly protecting my guys from traffic as they changed a flat tire?? Gave HRH and I both a cold. I was diligent about wearing a mask in my mother’s room so as to not compromise her precarious health. Breathing in those very germs that I would usually have been fighting off. Sniff…cough. But, life was good. Until our attention turned elsewhere….. The Princess has suffered from asthma for about six years now. Its usually seasonal. Happens when there is an irritating change in her world. She uses an inhaler and a nebulizer which generally accompanies us on overnights. On rare occasions we need to se the doctor for steroids. Heh. Left her meds at home…..as we charged from cold and snowy midwestern winter to cool and damp southern winter. Off we went to the ER – with my sister at the wheel – at the very hospital my mother was at. For three hours we dealt with intake exams, albueterol treatments, prednesone pills and chest x-rays (to rule out pneumonia). She totally charmed her nurse, the respiratory therapist, the x-ray technician (‘feel better sweetheart’…aww) and her very young, gorgeously tanned and handsome doctor who took one look at her tee shirt, shoes and clothes and asked if she liked color or something. : ) All the while she was playing with her i-pod touch and the hospital’s WiFi. We did Bible verse searches where I managed to amaze her by pinpointing where a verse came from. Thank you required Christian College Bible Classes! And we had a blast sharing our favorite scenes and lines from her new favorite movie – ‘Miss Congeniality’ with Sandra Bullock. I seriously do NOT know how this one slipped by my tomboyish FBI agent wannabee. She found a video tape in my parents’ collection and had watched it pretty continously in the prior days. And just in case it slipped by you as well, the movie is about a tomboyish FBI agent turned beauty pageant contestant who manages to make friends and save the world from a mad bomber. And you really haven’t enjoyed the movie till you have heard this 14 year old purr the Bullock lines “You liiiikkkkke meeee….You want to daaaate me…..” and then chortle with laughter when she tells how Benjamin Bratt’s character unwraps a Snickers bar and stuffs it in his mouth in response. Hilarious.